Search engine marketing is a practice by using the paid advertisements which appear on the search engine result pages. A professional search engine marketing company offers the advertisers the opportunity to appear their advertisements in front of influenced customers who are ready to get the service. An advertisement offers search queries alongside complete results. SEM is an umbrella term that is used for both paid search activities and SEO purpose. Atlantech Global, as a search engine marketing company, offers cost-effective solutions to the clients worldwide and drives conversion rates to grow your business online. The advertisements appear in the varieties of formats and those are often known according to the term of pay-per-click advertisements. Some are text-based and small advertisements to make the consumers capable to see about the important information regarding products, services along with the price and reviews at-a-glance. A professional search engine marketing firm maintains the most effective and powerful way to strengthen your online presence. Atlantech Global focuses on perfection, skill, and performance to facilitate the consumers with the proper application of “search engine marketing” term. It refers to paid SEM which is a system to pay the Google for showing their Ads in the search engine results. Hire a professional search engine marketing firm to increase the traffic at the top of the funnel. Following on page SEO, we help in ranking your site on Google Search. A keyword is the foundation of SEM campaign. Keyword management is a vital part of our advertising strategy. Selection of right keywords ensures you a better placement in the search engine. Display campaign is an important aspect of SEM campaign. A comprehensive research is required to identify your prospective customers online who are looking for your service. So, find out the most relevant keywords for your business. Search and Display campaign helps to optimize your website properly. We follow the latest, inventive tools to run the search and display campaign successfully. Emphasizing on video promotion helps to increase the interactivity between you and visitors. They become aware of your service through the video promotion campaign online. We provide full support to our customers whenever they require making us aware of their SEM related requirements. We also run Gmail campaign to add an extra advantage for our clients. The campaign is run to present a service or product globally. We are unique according to our efficiency, dedication and high level of work. Our quality service differentiates us from others’ services. Focusing on proper keyword analysis and perfect account structure motivates us to achieve higher click-through rates and our strong overall performance increases your business potentiality. An effective website analysis increases your website traffic with better website promotion. Focusing on keyword research is a vital part to follow up an effective online marketing strategy like SEM. Emphasize on Ad creation to make people know about your identity. It also helps to present you online. Advertisement creation is a new approach to present you online. Focusing on this part is an important aspect to make you recognizable among the other competitors. Landing page development is an important part of SEM that we follow to strengthen your online presence. We provide account set up service to facilitate the clients globally. The way of configuration facilitates the customers in the most prospective way. Our entire marketing team is dedicated to following up the testing procedure and tracking installation. Once a campaign is launched then it creates a proper communication between you and your customers. Focusing on monitor performance helps to maintain the SEM strategy that is useful to make your service reachable to your customers. Campaign assessment is an important criterion of SEM. The efficient marketing team follows a proper assessment procedure to present you online. Getting analysis feedback creates a strong platform online. So, make the analysis report properly for website optimization. How do I do SEM? You can open an advertising account with the search engines. As an example, Google's advertisement system is known as the AdWords. So, if you want to advertise on Google search engine then you need to create an AdWords account. You should use the Google AdWords to run and configure your ads. There is an equivalent system for both Bing and Yahoo and that is known as AdCenter from Microsoft. Is there any extra added advantage to run the paid advertisements? Yes. Firstly, you can get the ads up to run very fast. Secondly, with paid ads, you can control the ad message totally as well as you can change it anytime whenever you require. Thirdly, paid advertisements usually run in more places rather than running on the search engines itself. Search engines like Google have enormous advertisement distribution networks so that you can get more exposure. What are the classifications of SEM? There are two types of SEM: You can be seen in different search engine organic listings. These are some unpaid listings which appear on a search engine result page. It is called Search Engine Optimization (SEO). You can run the paid advertisements on different search engines. It is known as Search Engine Marketing (SEM). It is also recognized as Pay per Click (PPC) because you need to pay for the advertisements according to per click and not by the impression. Search Engine Marketing is an industry term for all types of strategies and techniques which are related to marketing and promoting the websites on different search engines. It includes ‘natural’ process like search engine optimization and ‘paid”, “inorganic” process like Google Adwords and Pay-Per-Click. What are the keyword terms and why those terms are so important? Keywords are known as the terms which people usually enter into different search engines to follow up a proper search for gathering complete information, unlikely products and services online. Search engines usually show the most relevant and proper web pages (from their index) in different search engine results. A search engine uses algorithms (it includes more than 250 ranking metrics) to define that which web pages are presented at the top of the result. One of the most vital metrics used is appropriate relevancy to the particular search term that is entered – otherwise, these are known as the keywords. Proper Analysis and Comprehensive Keyword Research are quite critical to understand that which keywords can be optimized properly for within the entire content of web pages. Using the most relevant and the most searched keywords are related to your services and products. It makes your business website easily found in different search engines. IS SEO be replaced with SEM or vice versa? No. 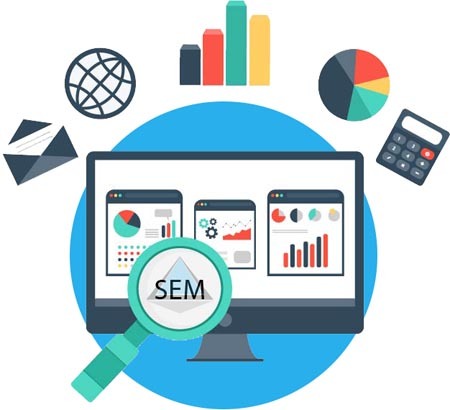 SEO and SEM both are quite different from each other. If you want to follow a wide range of marketing campaign, you require both of them.